Let’s get this straight. Wasn’t Thibodeau supposed to be the defensive guru? 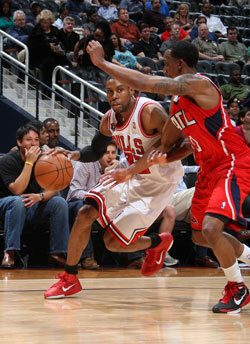 But there the high scoring Bulls go again Tuesday, this time with a 114-81 thumping of the Atlanta Hawks. On the road in the second of a back to back no less against a fifth seeded, a playoff team. It was the Bulls second straight win by more than 30 points, a franchise record two game margin of 73 points, and yet another offensive tour de force with 55.4 percent shooting, 10 of 18 threes and 30 assists on 43 baskets as all the starters but Luol Deng, of course, played fewer than 30 minutes. “Guys were making shots tonight, and that’s what we need each night,” noted Derrick Rose, who led with 30 points and 10 assists while making six of eight threes. The Bulls also remained second to Miami in overall field goal defense while taking a half game lead over Boston at 51-19 for the best record in the Eastern Conference. And while you see Rose’s mouth moving, it sure is getting to sound like Bulls coach Tom Thibodeau. It’s a thing of beauty when the games go like this, and as demanding as Thibodeau cares to be, his players seems like it’s barely enough for them anymore. Coach, may I have another! The Bulls blew this one open against a lethargic, seemingly disinterested Hawks team with an astonishing and enchanting second quarter—see, you can’t always wait for the last five minutes—as the Bulls set season highs with 41 points and 81 percent shooting, 17 of 21, in the quarter, and virtual perfection with 73.8 percent shooting with a 72-43 halftime lead and one first half turnover. The Bulls opened the second quarter, the reserves’ quarter, scoring on their first 13 possessions, the highlight a staggeringly uncanny—help, help, I’m running out of adjectives—behind the back dribble and drive for a reverse layup by C.J. Watson past Kirk Hinrich. If being given away for salary cap room wasn’t bad enough, Rose closed the quarter on a beleaguered Hinrich with three pull up threes over him in the last 1:46. So he can’t shoot, eh? I know we’ve celebrated Rose this season, so much that ESPN finally caught on and got permission from LeBron James to show other players. The popular SportsCenter ran a highlight package Tuesday of Rose’s best dunks. But the three point shooting, really, is historic stuff. In his first two seasons in the NBA, Rose made 16 three pointers in each and hit 24 percent. This season, Rose is among the leaders in the NBA in three pointers made with 112, more than top shooting guards like Ben Gordon, Aaron Afflalo, J.J. Redick and Anthony Morrow. Rose leads the Bulls in three pointers made and had made more than shooting point guards like Steve Nash, Chris Paul and Hinrich, the Bulls’ career leader. Maybe it’s occurred as I don’t have access to such statistics. But I doubt anyone has made such a quantitative leap in making threes in one season. And remember, this was a Bulls team that went 13 straight games in January without reaching 100 points and before Monday’s 40-point blowout of the Kings, the Bulls had failed to score 100 points in seven of the last 10. Talk about your peaking at the right time. And though many have questioned at times Thibodeau’s playing time for the regulars, there seems little doubt it goes a long way toward explaining the team’s upward trend. Even with another blowout win and the Hawks pretty much packing it in before halftime, Thibodeau stayed with his regular rotation well into the fourth quarter. Sure, you say, why not play some of the new guys or bench guys earlier and give them a longer run. Look, this isn’t fourth grade with everyone getting a fair chance to play or mom calls the coach. One way you build and improve is to remain consistent. As players have emphasized, Thibodeau has all season pushed repetition, doing the same things over and over, having that foundation and building upward. And staying sharp and on message, as it were. I noticed Phil Jackson Tuesday night played Kobe Bryant 48 minutes, Pau Gasol 52 and Lamar Odom 55. No one has played more games that these guys the last few years and they are much older than any of the Bulls regulars. Yet, the league’s most successful coach ever isn’t exactly resting anyone. So the Bulls with three main starters 26 years old or less should be resting their guys? OK, have we had enough of that? So the same guys play in the same places and with the same guys, that keeping the second unit together thing, and you begin to see why it is so important to Thibodeau in building the habits that teams like, say, the Hawks don’t have. I thought they did, especially Smith. Resistance to playing good, smart basketball. Smith is an athletic wonder, but he takes the league’s dumbest shots, bad, fadeaway jumpers over smaller opponents when drives would be easy. He came out after halftime in the first three minutes missing three stand still 20 footers. And the coach lets him. You’d never see that with the Bulls, who also have a rookie head coach, though you wouldn’t know it. There were famous squabbles between Smith and former coach Mike Woodson in Atlanta, and now you can see why they were necessary and why the Hawks were better under Woodson. Drew has no hold on the team and they are way out of control to the point of indifference. It was most evident at the end of the game with the Bulls getting a last rebound with 21.9 seconds left up 36 and dribbling the ball out so as not to further embarrass the Hawks. So their resident idiot, Hilton Armstrong, comes up behind Watson and steals the ball and shoots a three. Thibodeau was furious. Play to the last buzzer. Sure. They had barely played for 47 minutes. Though Armstrong is known for that kind of stunt as once when he was with the Kings in a career marked by being an underachiever and erratic, he went to shake hands with Earl Clark, then of the Suns, with a few seconds left in a blowout loss and when Clark reached to shake Armstrong stole the ball. He didn’t have time to score then, unfortunately. This time he made a three to get the Hawks deficit down to 33. “I’m at a loss for words,” said Drew. As well as a loss of control. Ah, but that’s the soon to be out in the first round of the playoffs Hawks. It’s not just all these record breaking numbers for the Bulls of late. It’s a swagger, a confidence, a joy, a sweetness of life, as Joakim Noah’s French would put it, around the Bulls that those around the NBA are seeing. The Bulls are moving the ball with alacrity and spirit, five and six passes in possessions routine. They go after loose balls and rebounds like kids chasing bubbles on a summer day with exuberance. It seems truly a game and games are fun. I had written after the Kings game Monday about Beno Udrih telling Kyle Korver how wonderfully the Bulls played, and this was a guy who sat on the bench for two Spurs teams, the Spurs being the ultimate in team ball if not media endearment. And I loved what one time Bull Brent Barry said on TV Tuesday in likening the Bulls to the unselfish, pass first Kings of the early 2000’s. With all the highlights and praise for Rose and all the relentless competitiveness demanded from Thibodeau, perhaps the most elusive and special element for this Bulls team is its unique blend. It’s not a group of 12 or 15 guys who are out together all the time. But it’s a group with an easy compatibility, almost like friends who haven’t seen each other for 20 years and can pick right up like it was last week. There isn’t a guy who complains or is moody or difficult to be around, guys who aren’t necessarily the top talents at their position but who blend together seamlessly. They have their roles and it is accepted. They don’t compete for shots or stats or awards or attention. They genuinely seem to like one another and root for each other. I haven’t worked at many places where it is like that. You watch the bench during games and it is alive with enthusiasm and attention. And they continue to play. There are so many examples, but there it was again Tuesday, the Bulls up 43 early in the fourth quarter with Watson hustling into the front court and passing to Korver who found Gibson sprinting the post lane and dunking. This Bulls team has made a practice of mentally taking names. You beat them and they remember. No one says much about it, but it came in an avalanche to start Tuesday and never let up. Luol Deng has been a rock all season, perhaps Thibodeau’s sentimental favorite, and quietly burning in his own right to show he can play through a season and at a high level. Deng came out with those slashing drives and Noah continued to go to his left hand on his drive, the duo giving the Bulls a 17-8 quick start. Then after Kirk Hinrich overplayed Rose and helped force a 24-second violation, Rose came alive with a behind the back drive past Hinrich and over Smith at the rim. Rose powered up for another layup, got his own miss back outworking the Hawks for a layup and hit Deng for a three to close the first quarter up 31-21. Then the Bulls quickly had the TNT crew wishing for fewer foul calls and a quicker ending with that marvelous second quarter. The Bulls, by the way, are now 16-4 with their regular starting lineup. Rose contributed one of those two handed slams in the second quarter romp, Boozer got deep in the post for easy scores, Gibson got himself another of those offensive rebound slams with a team high eight rebounds. How about 48-18 on inside points and 23-6 on second chance points? Wow. How dominant is that? Though the Bulls 47-point lead did get trimmed. 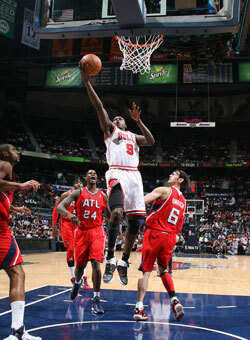 And Deng with 27 points got down the lane and dunked as he almost seemed to be wondering where everyone was. They were watching Bulls dust. It’s been quite the sight lately.